Here at ABCey, we’re always trying to stay on top of emerging conference and tech trends that continue to shape the industry. These days it’s less about going to a conference, and more about the experience! 1. Meetings are Experiences: Planners today are seeking more experiential programs that maximize attendees’ time, create an emotional connection between attendees and the company, and align with business objectives of the meeting. Last year, ABCey events produced an event for San Francisco’s biggest Security Conference, RSA and SpiderOak, a ‘zero-knowledge’ privacy cloud tech company for Penetralia: Privacy Matters. 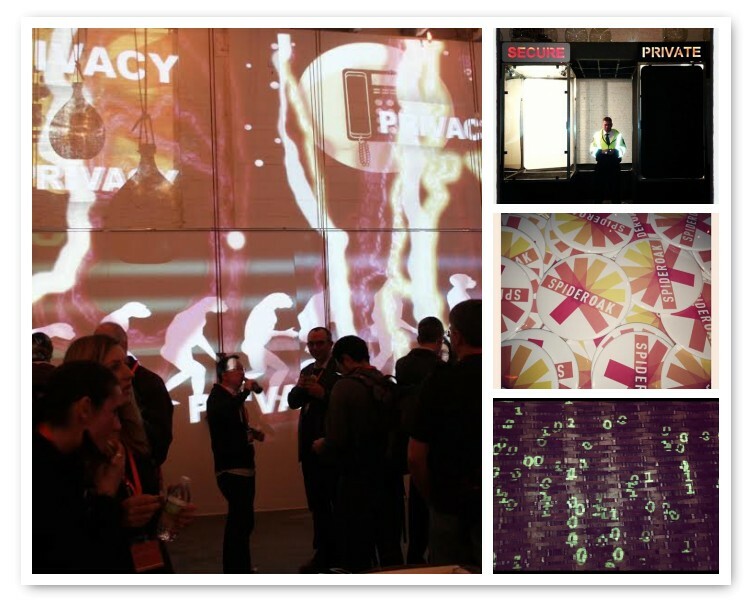 We incorporated live video mapping walls depicting the history and evolution of internet privacy, and created a experiential display with two boxes entitled “Privacy” and “Security” to show the difference between these two terms! 2. Mobile Technology: Like every other aspect in our lives, we rely on our phones or tablets to get us through the conference! 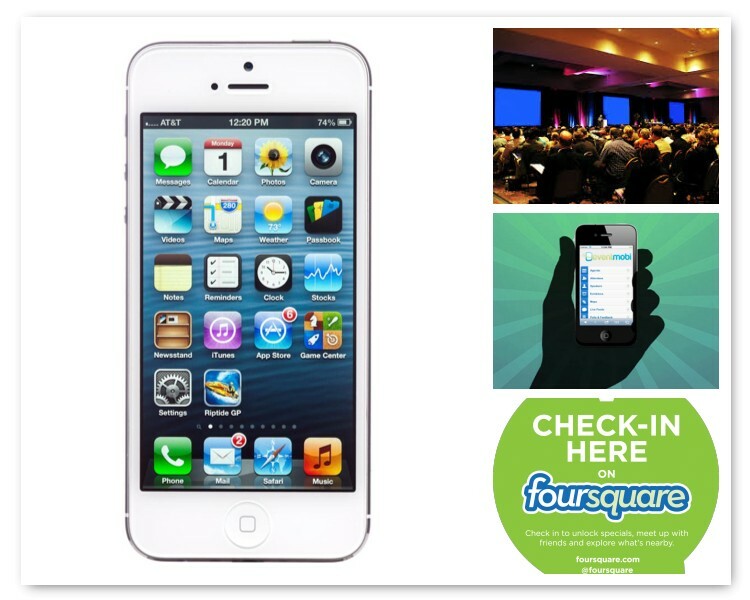 With the emergence of all these conference apps, such as eventmobi, foursquare, DoubleDutch and various social media platforms, the audience member can always stay connected, coordinate meet-ups and know what is going on at the event. 3. 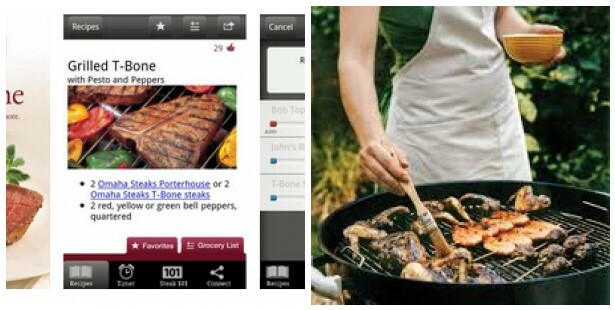 Interactive Technology: Some of the newest technology trends this year are audience focused. From responsive imaging to 3D lighting, these new technologies are paving the way for bigger and better technologies to take center stage of conferences in the future. 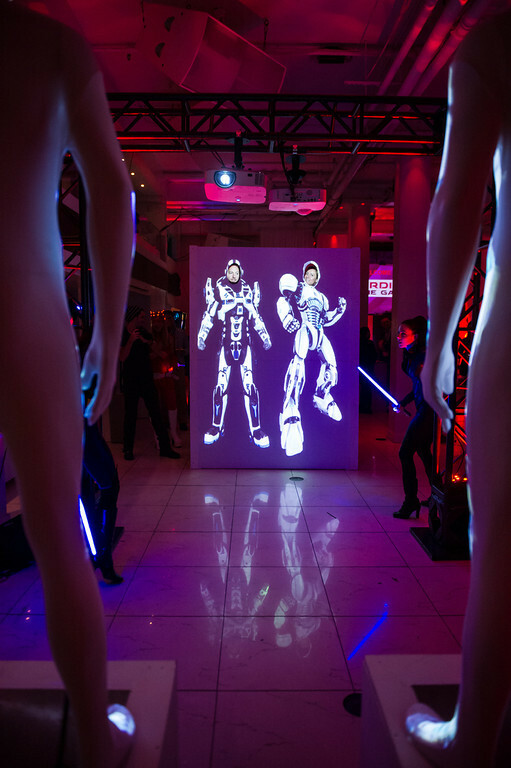 In February, we hosted FireEyes’ Guardian of the Galaxy themed party where guests were able to stand in as superhero cyborgs using 3D mapping and those images were projected onto mannequins posed and ready to save the world. 4. 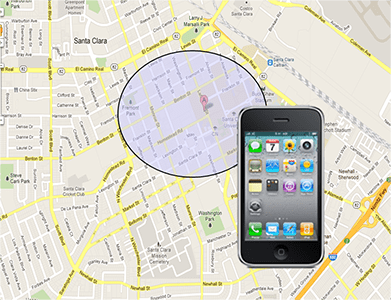 Geofencing and Location Awareness Technologies: This allows conference planners the opportunity to instantaneously send information out to attendees once they enter the geofencing proximity, making it significantly easier. 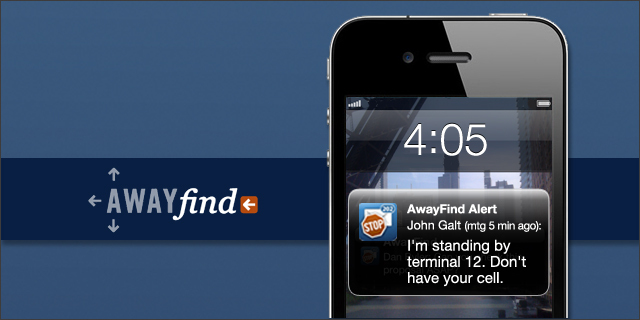 With location awareness technologies, guests can check in to a conference just by walking into the geofence zone! 5. Bringing In The Local Culture: Large conference halls are out and cultural city locations are in this year! 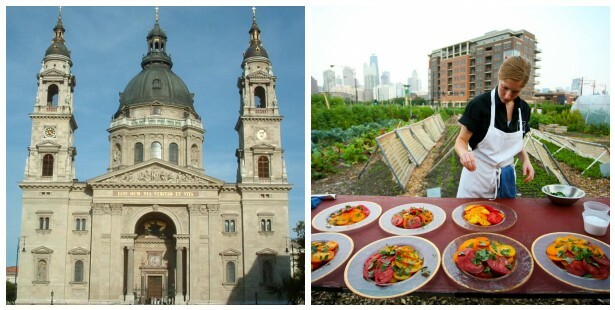 Attendees want a more local experience so planners are bringing in regional cuisines and farm to table-esque foods and topping it off with local craft breweries and wineries unavailable to people at home! What other trends have you noticed? Leave us your thoughts in the comments below or on Facebook & Twitter! 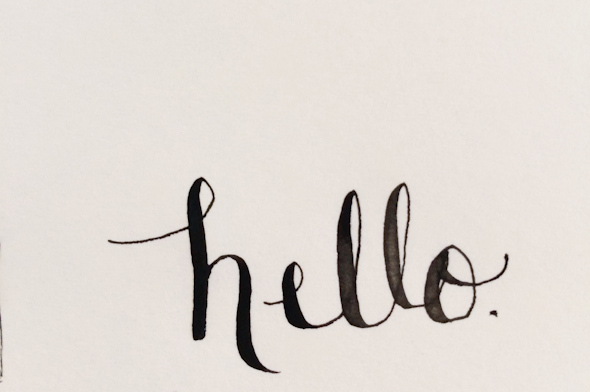 We can’t believe it’s August already! The girls at ABCey want to share our top picks for this weekend to kick off the last summer month with a bang! From tech events to chocolate tours, we cover it all! 1. 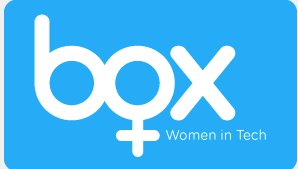 Meet, Mingle and Mentor: Box Women in Tech Social| Thursday, July 31| 5:30-8:30 pm| Box HQ 4440 El Camino Real, Los Altos| This is a great opportunity for Bay Area tech women to meet other women in the industry, network with one another, learn more about Box’s Women in Tech group, and look for potential mentors and mentees. 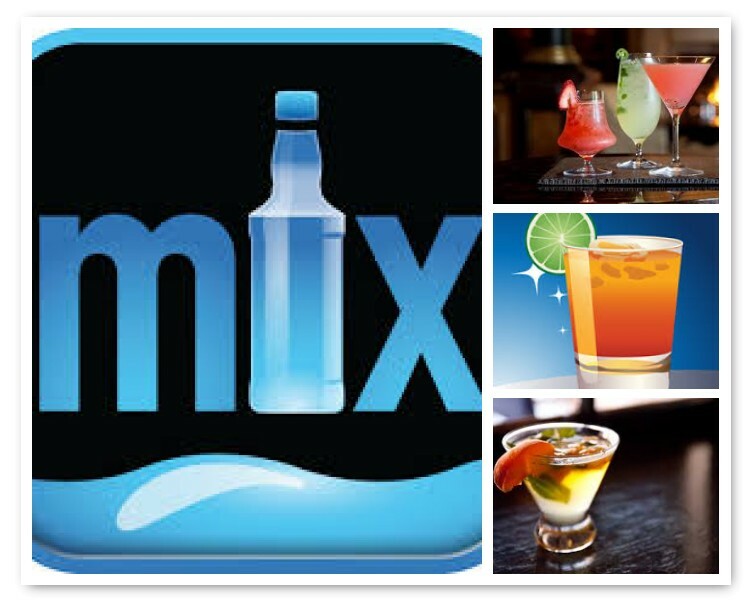 The event will include plenty of networking opportunities and delicious food and drinks. We love when women are highlighted and this looks a fantastic event to hear from some of the top women leaders in the tech industry. 2. Hustle Con | Friday, August 1st |Starting at 8:00am| The Brava Theater San Francisco |Hustle Con is a conference about learning the specific skills and tactics needed to start and grow your startup from successful founders. Learn from some of the founders of the hottest startups giving you specific advise to get it done yourself. If you want to learn real skills to grow your company and join a strong community of hustlers, then this event is for you. We love that this conference targets non-techies who think they need to know complicated coding in order to start a business! We agree with their motto, “You don’t have to know how to code to be an entrepreneur…you just have to know how to hustle.” Tickets range from $150-$350. 3. 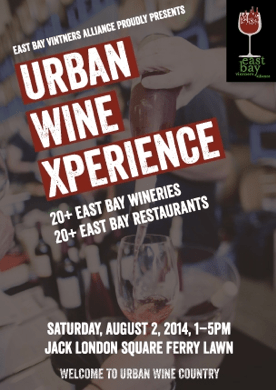 Urban Wine Xperience |Saturday, August 2nd|1:00 – 5:00 pm|Ferry Lawn at Jack London Square| Come over to the East Bay to experience over 20 urban wineries from the East Bay Vintner’s Alliance. There will be a wide array of white, rose, red and dessert wines for you to taste and enjoy. There will also be local eateries that will team up with the various wineries, creating yummy bites that pair beautifully with the EBVA’s wine portfolio. Tickets: $35 Wine Club Members , $45 Advance Tickets, $60 At the Door. 4. 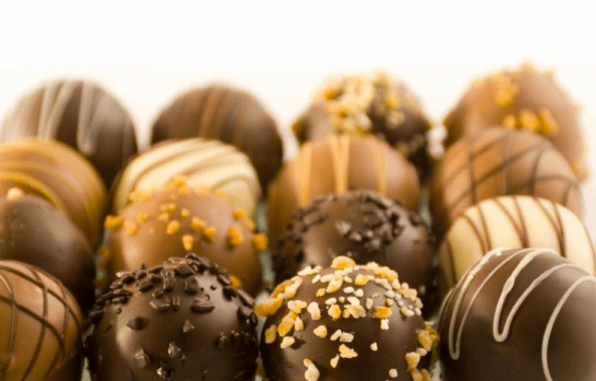 The Original San Francisco Gourmet Chocolate Tour|Saturday, August 2nd| 2:00 pm| Embarcadero Plaza, 1 Market St San Francisco| Who doesn’t love chocolate? On this tour you will learn about what makes fine chocolate and sample from a wide array of San Francisco gourmet chocolate boutiques. You will learn about the history of chocolate, its health benefits, and all the latest trends. Everyone on the tour will receive a Chocolate Lover Card entitling you to discounts and VIP treatment at 10 different San Francisco chocolate boutiques! How awesome is that!? Ticket price is $53 per person. 5. 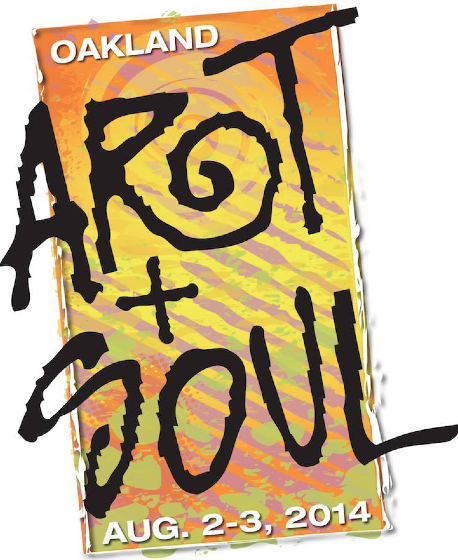 Art and Soul |Saturday August 2nd-Sunday August 3rd|Noon to 6 pm|Downtown Oakland|Thousands are expected for the popular two-day event, now in its 14th year, packed with music, food, fun, dance and art in beautiful downtown Oakland. Blues, R&B, Soul, Funk, Gospel, Rock, Latin, Turf and Urban/World Dance will take place on four stages. Prices at the gate are $15 adults, $8 seniors (65+) & youth (13-17), 12 & under free. Will you be attending any of these awesome events?! Let us know if we missed any in the comments below or on Facebook & Twitter! 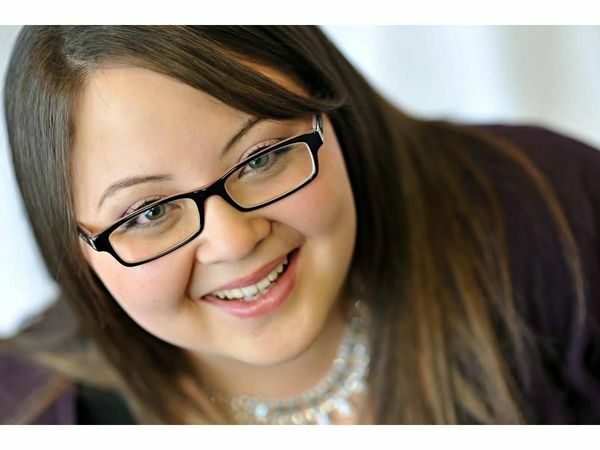 Tech Tuesday highlights the best and brightest ideas in the tech world. ABCey would like to recognize these up and coming technologies for their innovative ideas and ability to think outside the box! Whether they’re on your way home from work or as part of your weekend morning routine, farmers’ markets are one the favorite food stops for Bay Area locals. Capay Valley Farm Shop is the up and coming provider of farm fresh goods, but they take it to the next stop by bringing it to your door! Capay Valley Farm Shop offers a rare opportunity for families and institutions to buy 100% local, season food, directly from 40 small, family farms throughout the Capay Valley. Check out their website and raid the farm shop pantry, or order a biweekly bundle of fresh veggies, eggs, chicken and honey to your own doorstep. Every item for sale is locally, ethically and lovingly produced. Where else can you find small-town farmer’s market quality goods without having to leave your desk? Add in their homegrown jams, lotions and oils for a special treat in your next box. Capay Valley is using technology to help us progress towards a healthier, more humane society while also making our lives easier. Demand for local and unprocessed food is on the rise, especially in the Bay Area, so they couldn’t ask for a better market! They are spreading the word with their e-newsletter which not only entices you to sign up for their farm fresh goodies, but also spices up your week with new recipes! 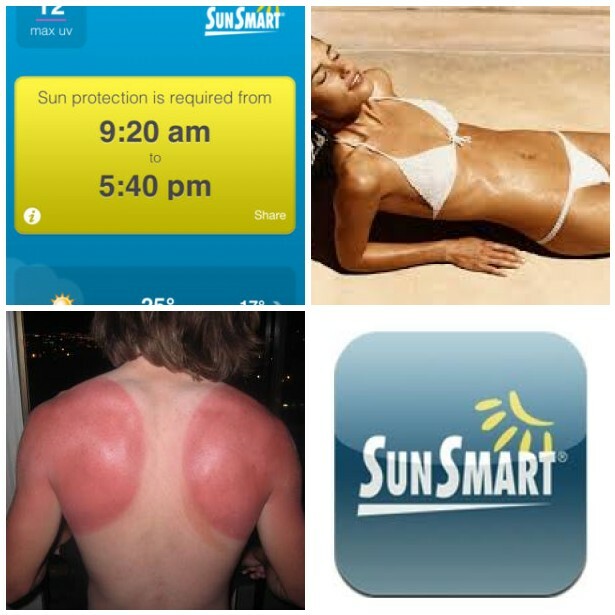 What do you think of this convenient healthy tech-savvy company? Let us know in the comments below or on Facebook & Twitter! 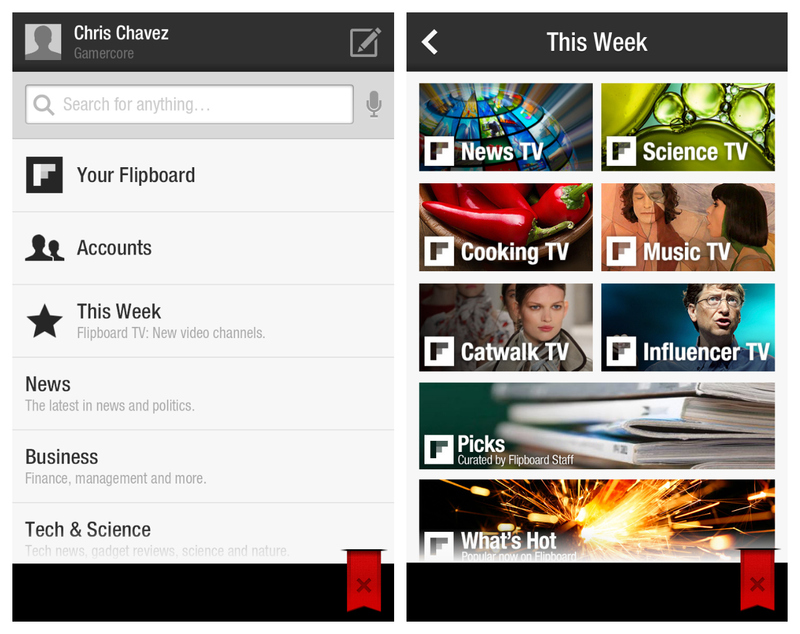 This StartUp Monday we are featuring the best social news magazine app Flipboard! Flipboard allows the user to collect and share news articles that they are interested in and create their personalized online magazine. 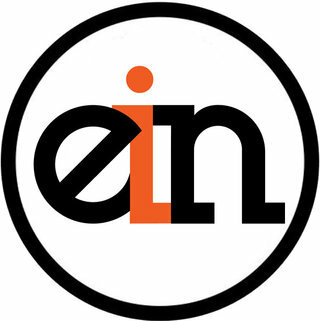 Instead of searching several different news websites or blogs, everything is curated into one simple individualized feed. 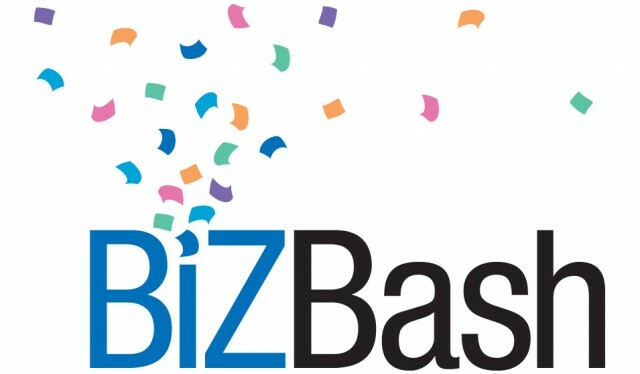 We also love that Flipboard has articles from major news networks such as BBC and very specific interest sites like BizBash for event planning tips. Flipboard makes it super easy for us at ABCey to keep up to date with all the latest event industry trends in one place! How It Works: Flipboard is a simple and super easy to use app for all of your daily reading pleasure! Once downloaded, the user will start by picking a few topics they are interested in and sign into their social media sites so that all their newsfeed updates will be listed. Once completed, the user will be directed to the “Table of Contents” which has four separate sections: things you follow, cover stories, content guide, and search. Even if you are lost on what to read, Flipboard’s content guide has tons of recommendations on top stories. 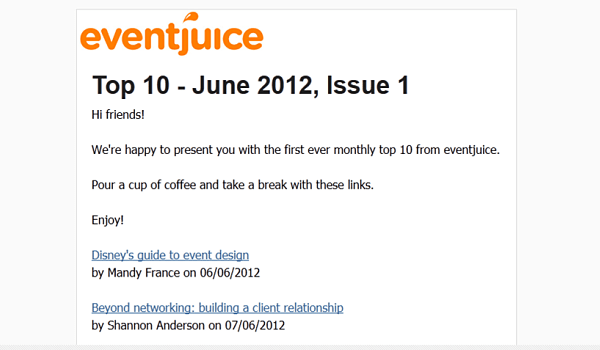 After the user is set up, they can add and scroll through their personal magazine to curate articles they want to read! Why It’s Great: Once the user finds an article they want to read, it is added to their personal online magazine and the pages flip in the same magazine way! The style gives the reader the sense that they are reading a full magazine, instead of only reading selected articles based on their interest. 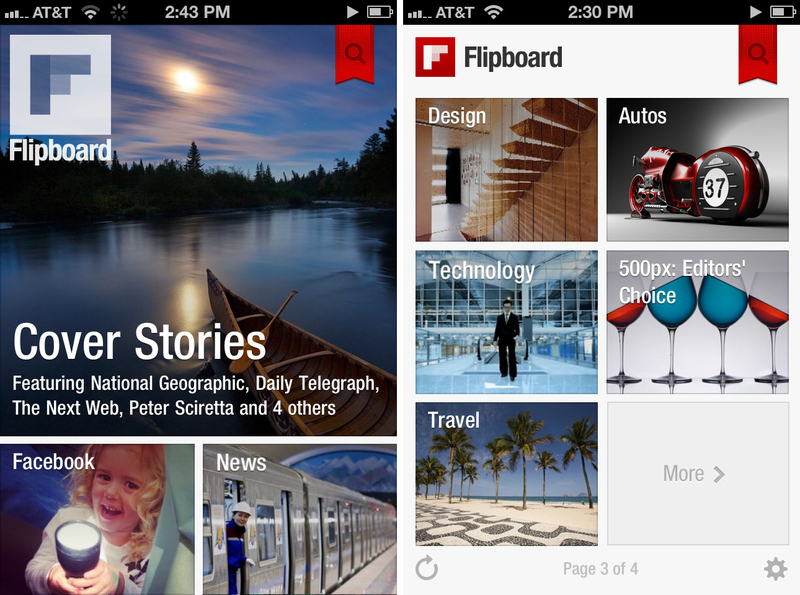 Will you be using Flipboard in the future for your daily reading updates?! Let us know in the comments below or on Facebook and Twitter! This upcoming weekend is looking to be a warm one and we couldn’t be more excited! There is something for everyone – from sport fanatics to music lovers. Read on for our top picks for events around the Bay that are guaranteed to be a good time! 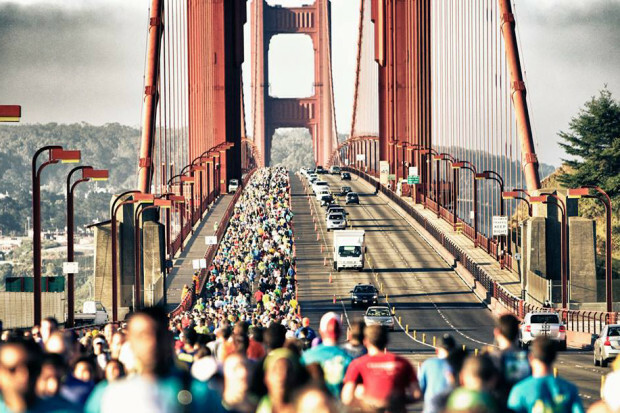 FEATURED EVENT: The San Francisco Marathon | Sunday, July 27th | 5:30am | Ferry Building, San Francisco | This Sunday, thousands of sneakers will take to the streets of our beautiful city in the 37th running of the The San Francisco Marathon (TSFM). This USA Track & Field certified race and Boston Marathon qualifier starts at the Ferry Building, runs along the Embarcadero, over the Golden Gate Bridge, through Golden Gate Park and Haight Ashbury before finishing in front of Cupid’s Arrow. The event includes a race for runners of all levels: 5K, half marathon, full marathon, double marathon. This is a perfect opportunity to support local runners while enjoying the Bay! 1. 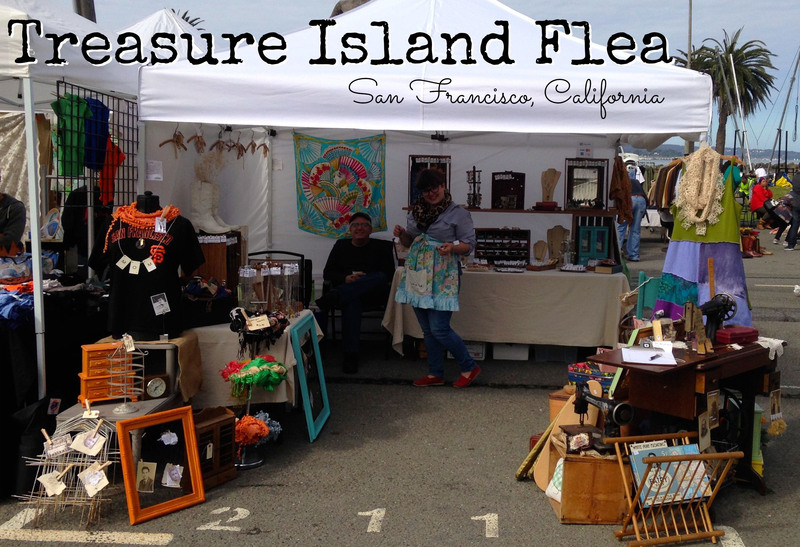 Treasure Island Rock the Summer | Saturday, July 26th & Sunday, July 27th | 10am – 4pm | Treasure Island, San Francisco | Celebrate the flavor of summer with the Treasure Island Flea this beautiful weekend! From food truck brunch, to DIY mimosa kits and ice cream on a stick, this event has it all! It’s also pet friendly, parking & children under the age of 12 are free. Otherwise, admission is only $3! 2. Rufus Wainwright & Quartlet San Francisco: Stern Grove Festival | Sunday, July 27th | 2pm | Sigmund Stern Grove (19th Avenue & Sloat Boulevard, San Francisco) | Grab a blanket & a cooler and come out to enjoy the sounds of acclaimed singer/songwriter Rufus Wainwright while he performs solo with piano, bringing together a rich blend of theatrical pop, cabaret, and classical styles. Opening the afternoon is the contemporary sound of instrumentalists Quartet San Francisco. Admission is free and it is a guaranteed fun time! 3. 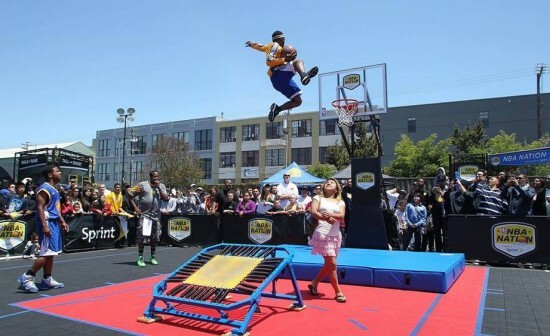 NBA Nation: Trampoline & Slam Dunk Showcase | Friday, July 25th & Saturday, July 26th | 12pm-8pm | Union Square Park, San Francisco | NBA Nation is 20,000 square feet of basketball action, including a full center court home to free interactive basketball activities, contests and clinics, and the opportunity to meet current NBA and WNBA player! 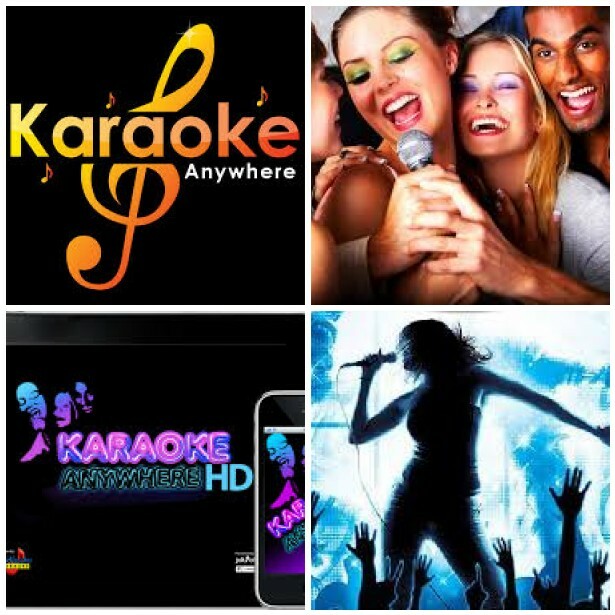 This event offers fun activities for all ages and will provide mind blowing entertainment. 4. 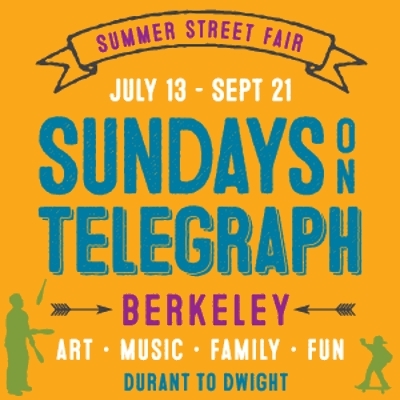 Sundays on Telegraph | Sunday, July 27th | 12pm-5pm | Telegraph Avenue, Berkley | Come enjoy food, art, live music, and family activities at this year’s Sundays on Telegraph! 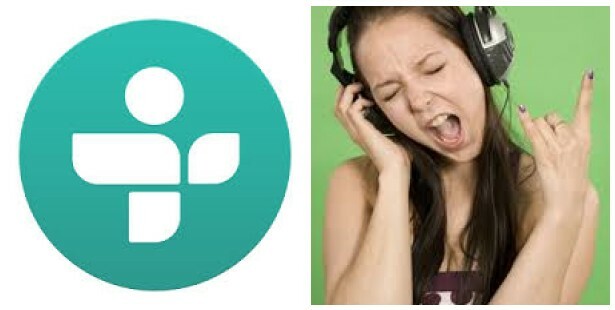 Music ranges from rock to blues, to folk, to hip-hop. Get ready for a circus-like atmosphere with a balloon clown, life-size chess, jugglers, and a stilt-walker. While browsing tie-dye and jewelry, listen to poetry, drumming, or the Cal Band, and relax with refreshments from local merchants at outside tables and umbrellas. A perfect day to make summer memories with friends & family! 5. 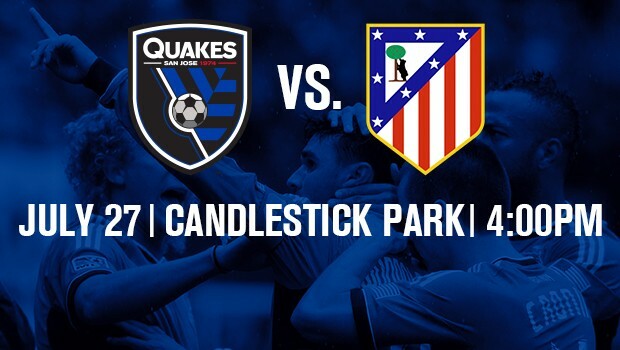 Atletico Madrid at San Jose Earthquakes | Sunday, July 27th | 4pm| Candlestick Park, San Francisco | For those of you who didn’t get enough soccer from the World Cup, we have an exciting game this weekend right here in our backyard! On Sunday, the infamous Candlestick will be transformed for the Earthquake’s Copa Euroamericana match against UEFA Champions League finalist Atletico Madrid. Tickets are running from $25-$200. If you love the game of soccer, you can’t miss this event! We are really excited about this gem we found! Intercom is designed to increase sales and foster customer loyalty, by combining all aspects of helpdesk, email marketing and automated marketing! Its goal is to let companies start meaningful dialogue with customers depending on who they are, and how they’re using an online product. It’s a whole new dimension in customer service, and designed by former employees of Facebook, Apple, Google and Amazon, they must have something special! 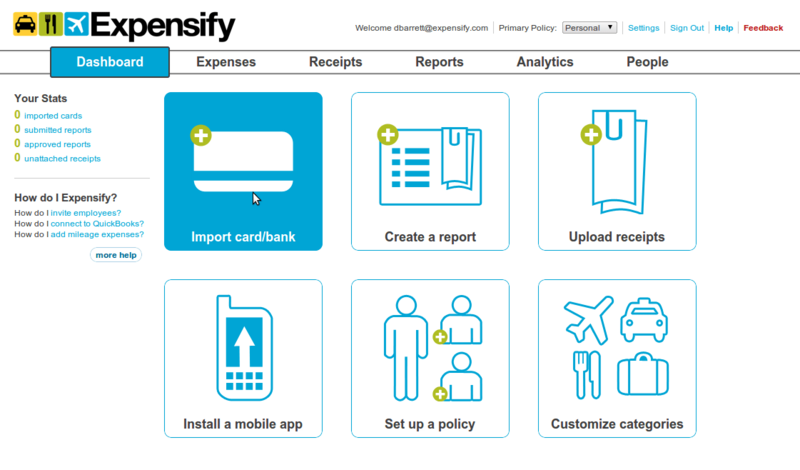 Reviews say Intercom is easy to use and the pricing is refreshingly transparent! 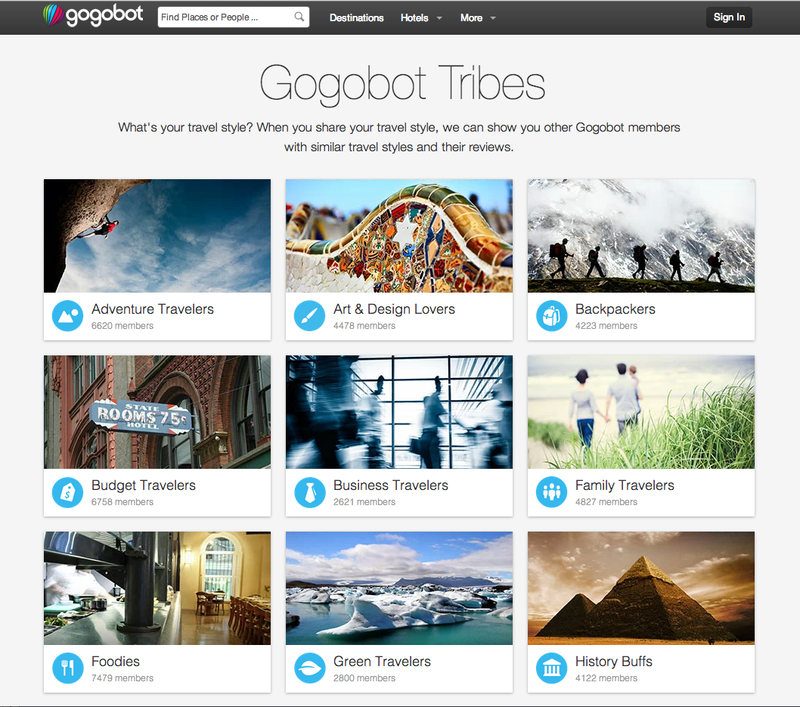 They are aiming to replace platforms such as Zendesk for customer support. We are really excited about it because as connoisseurs of digital marketing strategies, we love to see innovative new ideas that make it easier for companies and customers to interact and engage! Would you use this tool for your next website or app? Do you think it’s helpful for customers? We’d love to hear what you think in the comments below, or on Facebook and Twitter! The girls at ABCey have done some digging to make sure you have the best weekend possible! We’ve put together our top picks for the events happening in the Bay Area, and can’t wait for you to check them out! Featured Event | Chillin’ Productions Anniversary| Saturday, July 19th | 8pm-2am | Mezzanine, 444 Jessie Street | Twice a year, Chillin’ brings you artists and designers for your purchasing pleasure. This year marks the end of their 16 year run, and they’re going out with a bang of an anniversary party. The night will include 200 artists and 80 fashion designers displaying new styles available for sale. The night wouldn’t be complete without Chillin’ creator Irene Hernandes dropping beats with many other funky local musicians! This is your last chance to see SF talent showcased like this, so don’t miss the Mezzanine this Saturday! $10 cover. 1. San Francisco Symphony presents: Pixar in Concert| Thursday, July 17th – Sunday, July 20th| 7:30pm Thu.-Sat., 2pm Sun. | Davies Symphony Hall| From the Toy Story trilogy to The Incredibles and Up, Pixar Animation Studios has forever impacted filmmaking and given audiences of all ages some of the most beloved characters in cinematic history. This summer, the San Francisco Symphony presents Pixar in Concert, with visually stunning clips and memorable scores from each of Pixar’s movies performed live by the San Francisco Symphony. Just imagine how amazing it’s going to be to watch your favorite movie music come to life before you, from some of the most talented musicians in the area! Tickets start at $35. 2. 1000 Treasure Hunters | Saturday, July 19th – Sunday, July 20th| 12pm-4pm Sat., 5:30pm Sun. | J-Pop Summit in Japantown| Get ready for the biggest treasure hunt this city has ever seen. Thousands of participants of all ages are invited to search for dozens of clues and puzzles ingeniously hidden throughout Japantown. No special skills or familiarity with Japantown area are needed to play. The game starts with simple instructions of mysterious clues for you and your team. Use these and your skills of detection to find the treasure. The treasure is not “first come, first win,” so the goal is just to get to the X! Even if you don’t compete in the hunt, you can still get wrapped up in the secrets tales and magic that the J-Pop Summit revolves around this weekend in Japantown. There will also be cosplay and sake tasting, where else would you want to be? 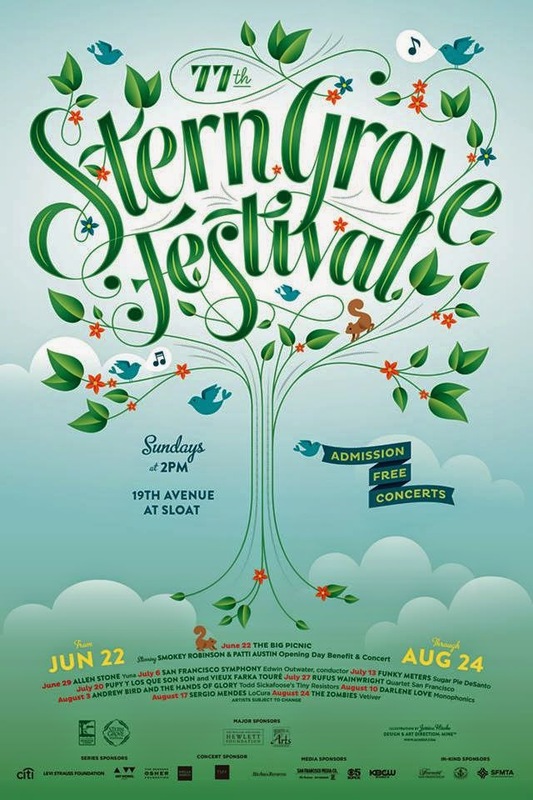 $22 to for the treasure hunt, no cover for festival. 3. PureVision | Friday, July 18 – Sunday, July 20 | Friday 12 pm – Sunday 9pm | Sopiago Springs Resort, Pioneer, CA | This feel good, family fun campout event started ten years ago in the beautiful Sierra Nevada mountains as a small scale festival and has transformed to a three day adventure with 52 DJs worth of bass-bumping house music. This festival lasts for three days and two nights, with ample family bonding opportunities, adventure, nature exploration and non-stop EDM! The event promotes mental clarity, dancing, barbecuing and naked swimming! Pull out your camping gear and head out to the woods for this very special “yearly migration of the North Bay!” Tickets $63 Presale. 4. Non- Stop Bhangra #105: Crash an Indian Wedding | Saturday, July 19 | 9pm – 3am | 161 Eerie Street, Public Works | This event really is one of a kind, and it sounds like so much fun! Have you ever wanted to crash an Indian wedding party, where you walk into a room filled with bright beautiful outfits, arms in the air, swirling of colors you’ve come to envy at traditional Indian Weddings? This month’s theme for Non Stop Bhangra is “Crash an Indian Wedding party”, without the guilt of not being invited. Put on your dancing shoes and show off the moves you will learn during the dance lesson or show off the moves you’ve been secretly practicing for the perfect occasion. Let’s dance together like it’s our own wedding, plus henna, indian snacks and dance lessons! This is a creative way to showcase Indian traditions and have a great time! 5. Summer Sundays Kickoff | Sunday, July 20 | 1-8pm | Mars Bar, 798 Brannan Street, SF | The Mars Bar has become famous for their Summer Sundays series, which boasts fun sundays of partying on the outdoor patio/tiki bar! The summer season kicks off on Sunday, with special music featuring David Harness, Kieth Kraft, Andrew Phelan and Johnny Collective! Come out for the first day of the week to enjoy some groovy tunes, sip some fancy cocktails and eat some scrumptious food! No better way to spend a San Francisco summer Sunday. “Everyday is a great day at Mars Bar”. Free before 3pm, RSVP here! So, what are you doing this weekend? Is there anything we missed? Let us know below in the comments or on Facebook or Twitter!